Preheat oven to 400°F. Combine the flour, cornmeal, baking powder and salt in a large bowl. Cut in 6 tablespoons butter with a pastry blender (or pulse in a food processor) until the largest pieces are smaller than a pea. Pour in the milk and stir or pulse just enough to moisten all the ingredients. (The dough will be very wet and sticky.) Turn dough out onto a heavily floured surface and pat until ½-inch thick. Cut into 2-inch rounds. Pat together the scraps and cut into more rounds. Transfer to a large baking sheet and bake until lightly browned (15-20 minutes). Remove from oven and set aside. While the biscuits are baking, combine the parsley leaves, mustard and remaining butter in a food processor and process until blended. 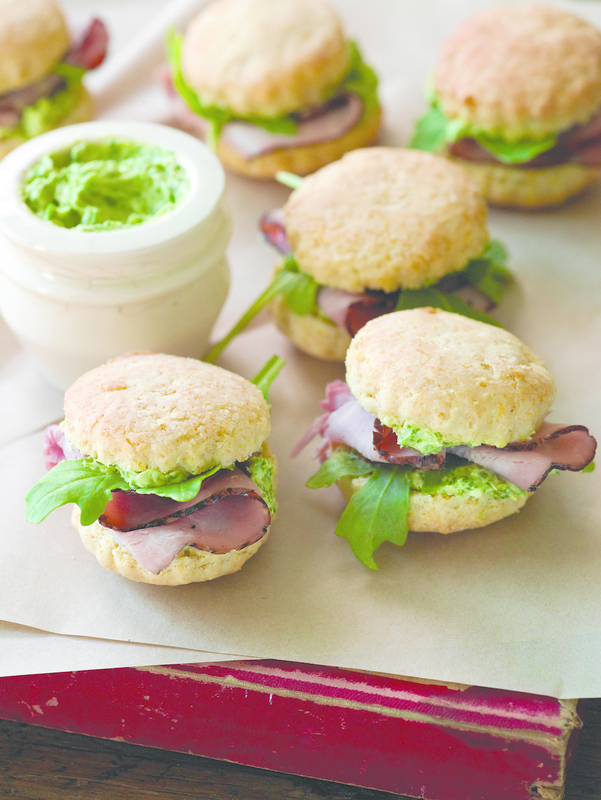 Split the biscuits in half, spread each with parsley butter, and fill with arugula and ham. Makes 28 to 30 servings.